A second mountain range on Pluto that rises from the dwarf planet's heart-shaped region, nicknamed Tombaugh Regio, is seen in this stunning image from NASA's New Horizons spacecraft. NASA unveiled the image on July 21, 2015. Pluto has a big heart — big enough to accommodate at least two sets of mountains, a new photo from NASA's New Horizons spacecraft reveals. New Horizons has spotted a second mountain range inside Tombaugh Regio, the 1,200-mile-wide (2,000 kilometers) heart-shaped feature that mission team members named after Pluto's discoverer, Clyde Tombaugh. 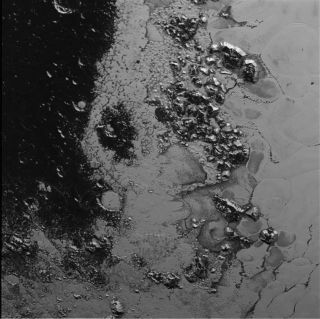 The new photo, which New Horizons captured during its historic Pluto flyby on July 14, shows a startling complexity of terrain within Tombaugh Regio, researchers said. "There is a pronounced difference in texture between the younger, frozen plains to the east and the dark, heavily cratered terrain to the west," Jeff Moore, leader of New Horizons' geology, geophysics and imaging team, said in a statement today (July 21) upon the photo's release. "There's a complex interaction going on between the bright and the dark materials that we're still trying to understand," added Moore, who's based at at NASA's Ames Research Center in Moffett Field, California. The lack of craters on Sputnik Planum suggests the icy plains are extremely young in geological terms — 100 million years or less, mission team members have said. But the darker terrain to the west is probably several billion years old. Features as small as 0.5 miles (0.8 km) wide are visible in the new photo, which New Horizons took from a distance of 48,000 miles (77,000 km). But the spacecraft zoomed to within just 7,800 miles (12,500 km) of Pluto's surface on July 14, so even more spectacular images of the dwarf planet should be coming down to Earth in the future. All of New Horizons' close-approach data should be in researchers' hands in compressed form by the end of 2015, while it may take another year to get the complete flyby dataset down to Earth, team members have said.